Remarkable matte gold filigree details on antique ivory and sparkling rhinestones make this Christmas Angel ornament a gift of sheer beauty. 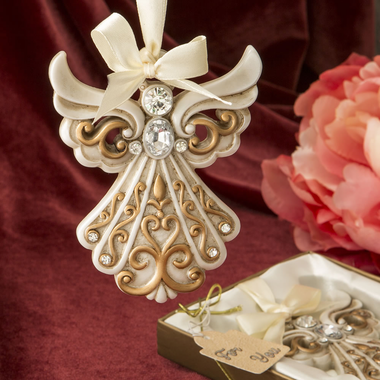 Made of poly resin, each ornament measures 4" x 3 1/4" and arrives neatly packed in a clear display box with a gold bottom. It also has a ?For You? tag attached to the silky satin bow on the halo. Whether it is for a religious event, winter wedding or a Christmas party, your guests are sure to fall in love with these impressive party favors and find a place to display it in their homes.